As one does I says thanks for the mention (it’s the polite thing to do). I’d been playing with my site last night, tweaking a little of this, tweaking a little of that and all on the live site I might add ( probably best you don’t do that if your site is getting any kind of traffic). One of those things I did was to use Google +1 to send a message saying should I just drop google +1 does anyone really use it? ( My verdict is still out. Tech people yes, normal people no at least as I see it) it was picked up though by the same Paul Conroy who’d mentioned me in the tweet earlier. As you can see from the above image they have a Facebook Like / Tweet / Pin It and G+1 link well I don’t really want the Pin It link for now. If I had more shiny imagery on the site I might again I’ve not looked into the impact that pin it can have on blog traffic. So enough with all my yadda yadda :) In my last post I went into how a couple of simple enough things could speed up your website no end. A 3.5MB page load became 2.5MB for 10 – 20 minutes work. I touched upon the idea of reducing the number of images that are getting loaded on the site. Not getting rid of the images as such just getting rid of the number of images that are getting loaded. Confused? :) I like to think I’ve done well. Lets get down to business and some tweaking of images and CSS hacking. Lets put the 3 images into the one image as tight together as possible and we’ll end up with the following. This image is 143 pixels wide. Time to figure out where the buttons are in x / y coordinates. I’ll also need to create some CSS for the site. The plan is to create a number of links for each of the buttons. The plan being to replace that with a fixed size background image and move the text out so it’s not seen by the user. There are pluses and minuses to this but we’ll go with this for now. The next element is going to be pretty much the same expect it’s the twitter button and it’s 62 pixels wide. We need the image to display the right place so we need to pull it back to use 49 pixels. Everything else remains the same. This link ends up being. You can work out any other buttons you’ve made but I’ll just make a follow me button for the facebook icon. We need to in that case pull it back vertically ( pull it up 20 pixels ) and we end up with .. So in my case here I’m ending up with 8 images in one. So now all we need is the various share code / URLs we need for each of the buttons. So we’ve gone and created a CSS sprite to do some shiny goodness for us. So you want to optimise your website. I started today feeling happy. I’ve been tweaking things on the work site. A little bit here a little bit there hopefully nothing you’d really notice but of course I spoke too soon and Kat mailed to say there was an issue with some of the updated CSS I’d been tweaking. Oh well you can’t win them all. So I load up their site and the first thing I notice was … hmm this is taking a while. Curiosity gets the better of me. I’m running Firefox ( as well as various other browsers ) and I’ve got Firebug running in FireFox which tells me pretty cool things when I check what traffic / load times on various things. So lets take a bit of a close look at the site. There’s nothing there that I see as being that strange. It’s a blog website. It’s a beauty blog website. That means they are going to be using a lot of photos on the site right? Lets dig a bit deeper. I’m showing 5 things that are going to be used throughout the site. They are all images. We want to make sure they are all as well optimised as possible. When you pay €100s for a program like photoshop you expect that when you save the image it’s going to be pretty well optimised. Unfortunately you couldn’t be further from the truth (unless you start tweaking settings and so on a hell of a lot). I’ve been told gimp ends up with similar results. 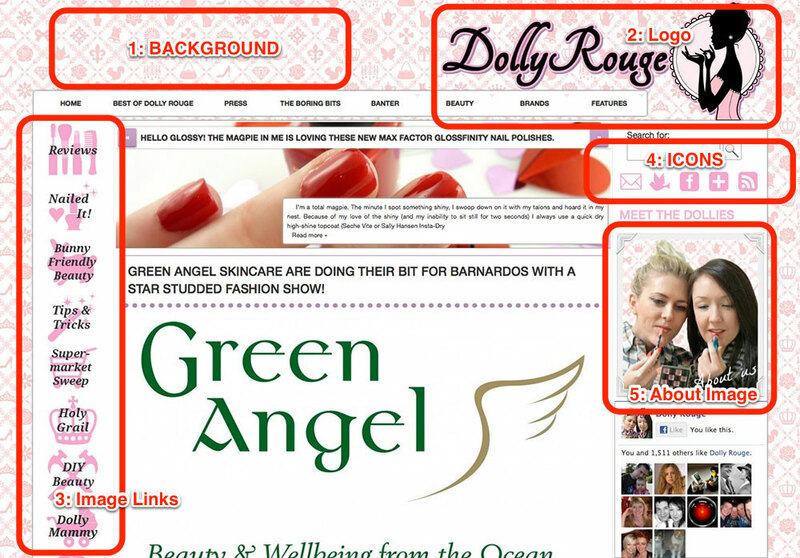 I can’t vouch for other tools, so lets check out what’s happening on Dolly Rouge. 1: The background image is a repeated image (wallpaper like). That’s cool lets take a closer look at it. However what Photoshop just gave me is a 66KB image give or take. Lets throw it into Tiny PNG and see what happens. We’re down to a 33.2KB from our original 190.2KB image. Not bad? and we’ve not even done anything much yet. 2: The logo / title image is very much the same. 80.6KB image reduces to 26KB that’s a 55KB / 68% saving. 4: The Social Ninja Icons on the right hand side. Similar to item 3 the space saving will be small but we’ll do it and we’ll come back in a minute to this. 5: The final item on our initial image is the About image. Lets just throw it into TinyPNG. Looking at the image though we can see that it’s actually wider than the space available. The image is 332×367 pixels. What is being displayed is only 240 pixels wide however. Using PhotoShop to resize the image we end up with an 111.8KB image. Using TinyPNG again and it’s down to 39.7KB. The big question here however is why you want to use a PNG image for this. There’s a transparency in the image so that’s the reason. Do we really need the transparency though? Using photoshop to save the 240 pixel wide image as a JPEG we end up with a 20.25KB image. A key point we should make is know when to use PNG and know when to use JPG. It’s unlikely you’re going to notice much of a difference in image quality in casual browsing and you can tweak the settings further if you’ve got time. I said we’d come back to items 2 and 3 ( The navigation images and the Icons ). When you load a website your browser generally only makes a certain number of requests at the same time from the same site. As a result your page / images / css / js don’t all load at the exact same time. In our example the site has 130 items to download. That .. is a lot if we think that only 10 items can load at once (random figure pulled from my head) then those 10 items have to be requested .. complete transferring and as they transfer we ask for more items. What we can do in the case of items 2 and 3 above would be to create a CSS sprite. 1 Image that contains all of those images. 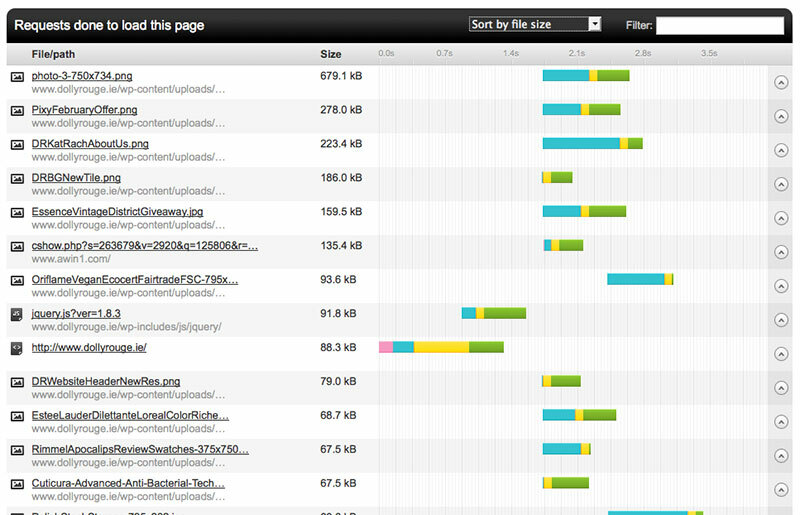 From our original pingdom tools requests / traffic we can tell a lot about our site. We can tell what’s bloating our website. We can try a few things to see if we can’t help reduce that. Simply by throwing all the png images into TinyPNG we can do the following. That’s 365KB saved. That’s without reducing the background image height to 1/3rd or reducing the about image size. We’re therefore talking nearly 500KBs saved for a few minutes work. It might not sound like much but it’s going to reduce the page from 3.5MB to 3MB. The blog posts which are image intensive appear on the front page as well. We could speed things up by not including the full post image and just having a featured image there (That would require a bit more knowledge and changes to the theme however). There are a number of other PNGs there as well 1 being a 685KB PNG which should really be a jpg. Making it into a jpeg and it drops to 72.3KB. We’ve just gone and saved 1MB on our front page. Does this really matter so much? I don’t know about you but i browse via my mobile from time to time. When I’m browsing with my mobile I don’t have access to WiFi so I’m relying on the mobile network for my Data. This varies greatly so trying to load a 3.5MB page is most definitely going to hurt. Even without thinking of mobile the page is taking 7.5 seconds to load on a desktop. That’s a long wait time especially if you don’t have fast broadband ( hint … it’ll be longer ) There are other benefits to doing these few small steps. 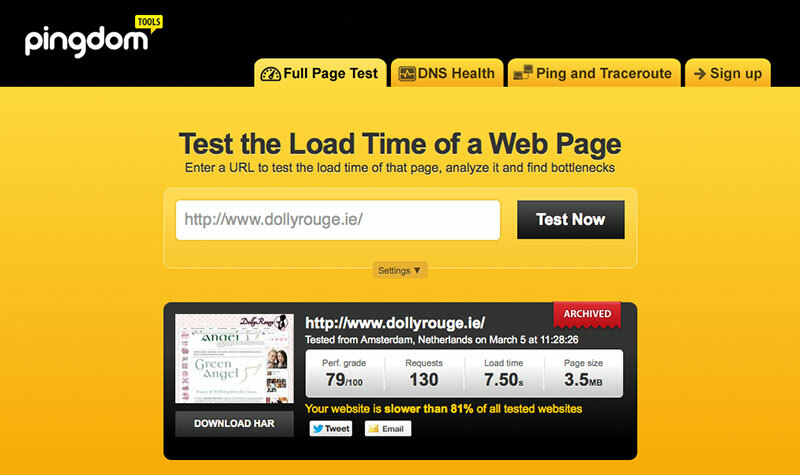 1MB saved per page load .. 1000 visitors a month … is 1GB of traffic saved. That’s just for one page with 1000 visitors. saving 20 requests might not sound like much either however if you’re running a busy site and have 10 visitors at the same time that is 200 requests we’re saving. We’d hope your visitors will wander through your site for a read. So it’s even more traffic / requests we’re saving.